I made the decision recently to give up red meat so instead we eat a lot more plant based, poultry, and seafood meals. When I do cook poultry, I usually prefer thighs as the meat is more tender and moist, and thighs are in fact quite inexpensive. My usual preparation methods for cooking thighs are to marinate them in lemon, olive oil, and seasonings, and then simply grill, roast, or broil them. From time to time, I like to do something different with the thighs and enjoy making different sauces creating entirely new flavor profiles. We like spicy food in my house, and when cooking anything Mexican, I like to find a way to sneak in some chipotle chili peppers. If you are unfamiliar with chipotle peppers, they are small peppers (often jalapenos), that are usually 2-3 inches long that have been dried using a smoking process that gives them a dark color and a distinct smoky flavor. The peppers are sold dried, ground as a seasoning, or canned in a red sauce that has a delicious smoky flavor as well. These canned peppers are called “chipotles in adobo” and can be found in the Mexican section of most grocery stores. We love the smoky heat these peppers add, but if you are cooking for children, you may want to decrease the amount of peppers you use in the sauce. 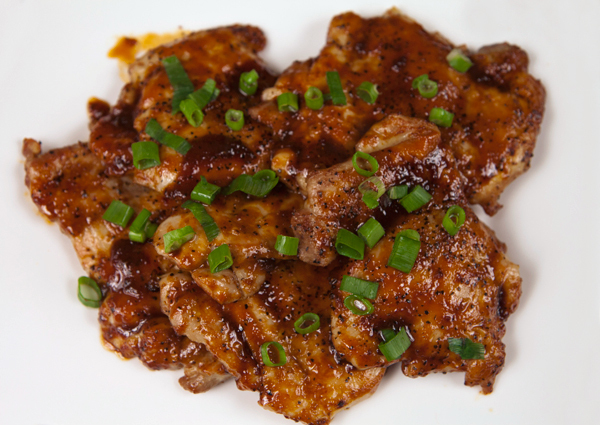 For this recipe, I use boneless, skinless, chicken thighs that I trim of all fat. I then use a meat mallet to pound the thighs so they are of equal thickness so they cook evenly. These thighs are cooked under the broiler instead of the grill, so you can have tasty barbecue thighs year round no matter how cold it is outside. In a small pot, heat the olive oil over medium heat, then cook the onion until it is translucent, about 5 minutes. Add the garlic and cook until fragrant, another minute or two. Add the remaining ingredients, stir to mix well and bring to a boil. Reduce the heat to a simmer, and continue to cook for 15 minutes, stirring occasionally, until the sauce has thickened. Taste, and adjust the salt and pepper as needed. Use a meat mallet, and pound the thighs until they are of equal thickness. In a small bowl, mix together the paprika, sugar, chipotle powder, salt and pepper, and sprinkle this over the thighs. Line a baking sheet with aluminum foil, then brush lightly with olive oil. Place the thighs on the baking sheet, then broil 4 inches from the heat, and broil for 5 minutes. Turn the chicken, and continue to broil another 4 to 5 minutes until the chicken is cooked through. 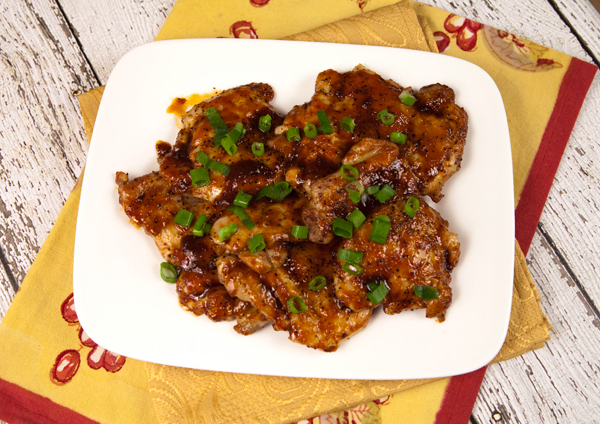 Brush the sauce over the chicken, and broil for 2 minutes. Turn the thighs, brush with more sauce, and broil another 1 to 2 minutes. Arrange on a platter and sprinkle with the chopped onions or cilantro.